High River was hit hard by the flooding that struck southern Alberta in the summer of 2013. The town’s entire population of 13,000 people was evacuated, and property damages have risen into the tens of millions of dollars. Many residents are being forced to rebuild their homes virtually from scratch, and as quickly as possible. This is where structural insulated panels (SIPs) come into the equation. These unique construction panels allow builders to create custom, structurally superior houses in very short periods of time. They offer every bit as much structural soundness as traditional I-beams and columns, but with added benefits. If you are seeking a way to erect a custom, well-fortified house on a tight schedule, SIPs offer advantages you should know about. SIPs are large-format boards, which surround a rigid polymer foam centre. They are typically 4 feet wide and come in a range of lengths, typically spanning 8 to 24 feet. While structural insulated panels are most commonly used to build exterior walls, they are also excellent for constructing roofs and are ideal for creating lofts and attic spaces. As mentioned, SIPs can be used in place of I-beams and I-columns. The insulated core provides the structural integrity, acting almost like a web, while the exterior sheathing replaces the function of beam and column flanges. They are available in a range of thicknesses, with thicker panels being used to build exterior walls and thinner panels used for roofs and ceilings. One of the primary benefits of structural insulated panels is that they fulfill the functions of multiple structural elements in a single piece of building material. They provide insulation, act as an effective vapour barrier, stop air leaks, and eliminate the need for joists and studs. Reduced overall life cycle costs. Because SIPs can be used in walls, roofs, ceilings and even floors, they provide excellent insulation throughout a home and are particularly useful when used to seal off otherwise uninsulated spaces. On the whole, structural insulated panels can cut down overall home life-cycle costs by as much as 40 percent, depending on where and how they are used. Energy efficiency. Inadequate insulation and air leaks are responsible for the majority of energy losses in the average home. Because structural insulated panels provide optimized insulation and virtually eliminate air leaks in every part of the home in which they are used, you’ll have an easier time maintaining a comfortable indoor temperature all year long and you will prevent heat from escaping through cracks and gaps. Also, because SIPs double as vapour barriers, you’ll reduce problems with humidity, which can in turn prevent a whole host of problems, from toxic mold to structural damage. Labour optimization. While structural insulated panels require specialized equipment to hoist into place, they reduce the number of workers needed on the job site as a whole. This helps home builders control costs, which will be reflected in your bottom line. Versatility. Structural insulated panels are one of the most versatile elements used in the construction of residential buildings. The more places in which they are used, the greater the overall benefits to you. 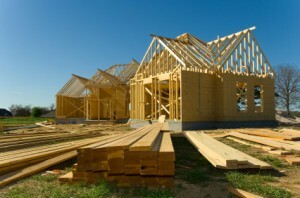 One of the major limitations of SIPs is the fact that their initial cost tends to be slightly higher than what you would pay to build a house with conventional framing, however, given that SIPs significantly speed up construction times while enhancing the overall energy efficiency of the home, many people find that they actually help save money in the long run despite the costlier up-front investment. Fine Line Homes is a leading builder of custom homes in southern Alberta. Structural insulated panels are one of the many building systems offered by the company, and Fine Line Homes also optimizes energy efficiency in all its custom builds. If you are looking to build a new home and you want to enjoy all the many benefits of energy efficiency, Fine Line Homes offers affordable solutions that work within most any construction budget. To learn more about High River custom homes, or if you have any other questions about structural insulated panels, please contact Fine Line Homes today.